Thank you for your interest in our apartment, in which we welcome you! The apartment Owwe (Odenwäldlerisch for: Above) is located on the upper floor of a semi-detached house in Neckargemünd. The house has been extensively refurbished in recent years, energetically trained and provided with new technology. Neckargemünd is located about 8 km east of Heidelberg in the heart of the Palatinate and the Rhine-Neckar metropolitan region. The house is located in the quiet Hollmuthstr. 72 in a panoramic position on Hollmuthhang. 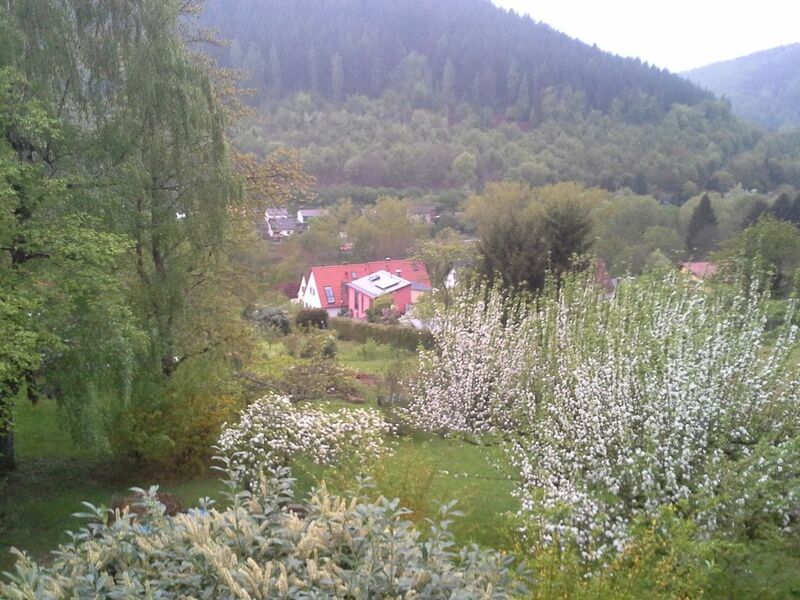 It is 100 meters to the forest and the Neckargemünd Altstadt S-Bahn station is 1.1 km away and a 15-minute walk away. At the house is a covered parking (carport) or Street parking available. An external staircase leads to the entrance and covered terrace with south exposure. Immediately left the bedroom with double bed (160 cm wide), wardrobe and small table (LAN socket). Here is also the possibility to set up a travel cot. Now across from the daylight bathroom purist and elegant with shower, toilet, vanity with utensil drawers and a towel radiator. Further down the hall you will find the kitchen-dining area. Seating provide bench and chairs on the wooden table. The white kitchen is fully equipped: fridge with separate freezer compartment, dishwasher, sink at the window, coffee machine, kettle, microwave, oven, induction hob, toaster, hood and dishes and utensils for up to 6 people (highchair on request is of course). Continue into the living room:> WOW effect !!! Panoramic picture window over the whole width of the room offers a really great view of the gardens of the plots and the wooded mountains. The sofa can become a bed for two people. Now up further (quite owwe) over a steep staircase in the loft. There are two single beds, a writing board (LAN) at the window and another toilet with a small sink. And already our little tour has reached the end. For each additional person € 15,00 will be charged. The final cleaning is estimated at € 35,00. From a rental period of 7 days we grant 5% discount, from 28 days 10%. Linen change (yourself!) € 12,00 / person (sheets and towels). The apartment is equipped with a ventilation system, central vacuum and electric shutters. Wireless Internet connection (100 MBit / s) and a telephone (German landline) are available free of charge. Please note: this is a Non smoking apartment where pets are not allowed. In the garden area u. Garden use on over 1000m ², we are not quite ready. However, you can literally "overlook" this apartment. Here we ask for your understanding. What else is needed? Bakers, butchers, hairdressers, banks, supermarkets, bike shop (rental), pubs, restaurants, cafes, canoe rental, wine shop, pharmacies, suburban train connection, main train station, bus connections, Neckar shipping, hiking and biking trails, forest, swimming pool, market, Old town, castle ruins and so on are located in Neckargemünd. The beautiful sister of Heidelberg called looks back on the old town on a 1000-year history with remains of the city wall and the castle ruins Reichenstein back. We wish you a relaxing stay. Waren mit 4 Erwachsenen und 2 Babys in dieser super modernen und gut ausgestatteten Ferienwohnung. Der Vermieter war sehr nett und hat alle Extrawünsche möglich gemacht. Wir kommen gerne wieder. Wir haben einen schönen Kurzurlaub in Neckergemünd verbracht. Die Wohnung ist sehr schön eingerichtet, neu, alles super sauber. Wir haben uns Ruhe gewünscht und diese auch gefunden. Der Blick zum Wald hin ist wunderschön. Herr Stock, der Vermieter, ist sehr freundlich und zuvorkommend. Wir haben uns sehr wohl gefühlt. Vielen Dank. Besten Dank Eva für Ihre Bewertung und den respektvollen Umgang. Das ist für uns eine schöne Bestätigung !! Gerne stehen wir Ihnen für eine nächste Auszeit zur Verfügung. Wohnung ist neu, schönes Blick von Wohnzimmer, Küche + Wohnung sehr gut ausgerüstet. Wohnung angenehm. Schlafzimmer ist oben (Dachetage) für Kinder separat. Sehr ruhig kein Nachbar unten. Berühigend und 10 Minuten entfernt von Heidelberg Stadt. Sehr schicke, neue Ferienwohnung, netter Kontakt, lief alles bestens! Die Wohnung ist ganz neu und sehr gut ausgestattet. Wir haben uns wohl gefühlt! Hallo Anna, ein Dankeschön für Ihre Bewertung und bis zum nächsten Mal Ihr Andrej S.